Ideally, a man’s bike should be like his cell phone—a device thoughtfully selected and customized for his needs, synchronized to his instinct, intuitively responsive in a crunch. Such was not the case with Des and me. Ours was an arranged marriage, so to speak, one based more on cold practicality than true love. The following originally appeared in the October 7, 2010 edition of the Tooele Transcript Bulletin. I don’t remember exactly when the hair on my neck stood on end, but it must have been sometime between the first lightning flash and my realization that I was the tallest object around for at least a mile. One thing was for certain: The modest storm that hung above Rush Valley ten minutes ago was suddenly a torrent directly on my heels. Was it one mile per five seconds between lightning and thunder or one second for five miles? I scrambled for the answer, but now was not the time for math. Now was the time for pedaling. Furious, superhuman pedaling. To be brutally honest, Des is a short-term substitute. She’s a surprisingly worthy fill-in, but a fill-in nonetheless. I hadn’t so much as looked at other bikes until my regular mountain bike broke down last year. It’s a sad story, really. The high-end model Marin was a noble of her day. A friend, the vice president of a scented candle company, bought her new about 15 years ago. After striking it rich during the scented candle bonanza of the late nineties, he sold her to another friend. I bought her a couple years later. Despite her age, the bike is streamlined, sophisticated, and light as a feather. Together we’ve tackled many a trail. The trouble started early last year when despite my careful nurture, the Marin’s original components began to surrender to the ravages of wear and time. First to go were the handlebar grips, which wasn’t too big a deal. Neither was the wobbly, untruable front wheel. But then the derailleurs failed, followed by both shifters. I continued to ride the Marin in one gear until her worn crankset teeth could no longer grab the chain. Finally, during an ill-fated ride to Jacob City, the chain snagged and jammed, and the old Marin finally succumbed. That’s not to say she’s beyond repair. Her frame is solid as ever. It’s just that getting her trail worthy again will mean replacing nearly all of her components. And that would require funds that, at this juncture, would be more wisely allocated to things like diapers, milk, and car repairs. The Marin was essentially down for the count, and I was a man without a bike. That changed a few weeks ago when my wife called me from the Deseret Industries thrift store. “Awesome!” I responded, feigning excitement. I’ve never been an only-the-best-will-do type, but a bike from the D.I.? I wasn’t optimistic. When she returned home with it I realized I should have had more faith. My new bike was an older model Mountain Tek with. Indeed. While it was by no means a perfect bike—its frame is slightly small for me and weighs roughly a ton—it sported solid components and nearly new tires. Judging by its relatively good condition, its previous owner kept it safe in a garage and only rode it to the library once a month. I was back in the trail riding business. I named the bike Des in honor of its humble origin, and in keeping with what Google says is biker tradition, “it” officially became a “she.” I took Des to local bike whisperer Curtis Beckstrom for inspection. Beckstrom, a retiree who spends most of his days building and donating bikes to the homeless, was quick to praise my wife’s find. “Twenty five bucks? She did well,” he exclaimed. Beckstrom replaced both tire tubes, lubricated the shifters, and adjusted the rear derailleur. Des was now ready for a shakedown ride. The next day we rolled onto a dirt double track at the intersection of Droubay Road and the railroad tracks in Tooele. Cove Trail is the newest on the Tooele County Trails Commission’s roster of public trails. Originally named for the Erda developer who donated land for the parking lot, Cove Trail derives its current name from the unique geologic formations crafted by the ancient Lake Bonneville. 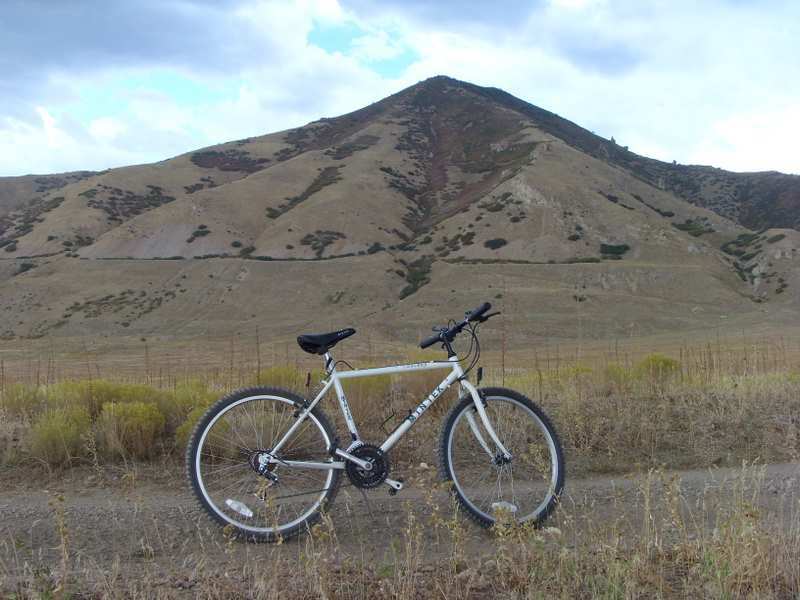 The trail provides access to a mountain biker’s paradise on the BLM managed Oquirrh foothills. Des rode smoothly, effortlessly sinking into and climbing out of ruts in the dusty road. I ignored the looming storm as I glided along a 10% grade into the foothills and curved south toward Pine Canyon. Arranged marriage or not, Des and I were syncing well. The small raindrops that preceded the storm made a thick mud to test her tires. I photographed my new bike against an Oquirrh backdrop. The air was heavy. The sun’s diffuse rays cast a soft light on the strange rock formations above. I was thrilled, and I imagined Des was too. Her real test came when the lightning started. Raindrops had yet to fall, but the strikes were coupled almost simultaneously with deafening thunder claps. I put boot to pedal and raced at 16 miles per hour toward a lone tree near the trail head. My trusty transport and I were soon overtaken by the deluge, which hampered visibility and rendered the road a muddy mess. The rain continued, but the lightning retreated along the final stretch of trail. I reduced speed and played in the ruts before ending the ride.